Martin Austin, a popular industry character, has returned to the industry with a new role at Harry Levy. Martin, who has previously worked for several high-profile industry companies including Reflex Gaming, has returned to a field sales role at Harry Levy after his break to work in property. "The grass was not greener, that's for sure," Martin says about his return to the industry. "I soon realised that this industry was in my soul and was lucky enough to join Harry Levy at the end of 2018." 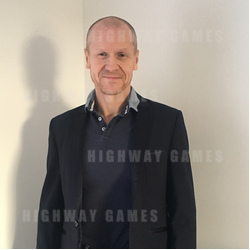 Making his debut at the Harry Levy stand at EAG 2019, Martin will be taking over the role of Micky Kennedy, who decided to retire last year. "Micky has left a large void and I am doing my best to fill that by taking over his accounts and developing new business," says Martin. "I will be actively engaging in conversations with customers about new equipment and new ideas." All customers who previously dealt with Micky Kennedy are welcomed to contact Martin while he settles into his new role. If you didn't catch him at EAG, he can be contacted at ma@harrylevy.com.